Ha! When I come across a day or even week like that, I hunker down and aim to finish no further behind than I was when I started. Managing expectations seems to be the key to happiness when things turn bad. Well, teeth are important. 😉 Good luck with the rest of your week. I hope you find some great things! Life, for those of us who reach out and grab at it so’s we can put it to paper (or electrons in a laptop), is full of moments to remember. Someday it will end up in my fiction, but those “find me” applications are great for finding those annoying devices that wander off. She, who shall remain nameless, lost her iphone. Well, she didn’t “lose” it, she just knew it had been stolen. In fact, the application told her where it was. The overhead map feature on her husband’s iPad showed her exactly where it was. About half a mile away in a residence. Aha! The “thief “had been found out! Enter the local law enforcement professional to take the “theft” report and go off to confront the thief. Meanwhile, her retired detective brother-in-law (gee, I wonder who that could be? ), even though she insisted she had searched “everywhere”, did a quick sweep of the kitchen, laundry room and her car in the garage. She was soon able to use her “now not actually stolen” iphone to call the cops and tell them she had found the phone in the console of her Ford, right where she had left it before panic had set in. I know the feeling! sharing! Ugh..I’m right there. Wishing I could have all the time back that I waste looking for stuff. I hope it was an inexpensive earring that stayed in the weeds, Beth, not the cell phone or — shuddering at the thought of it — the laptop. Maybe a flip-flop, even. You are a very good sport, Peaches. I’m at the point where I can go into a new room of a search and declare “What was I looking for again?? ?” Yeah, we are the class of 57. ❤ I'm so with you, my dear friend. Find, find, find! Love it lol brightened my morning. At lay I know am not alone. My world revisited! Have a great day! I’m glad you have your chompers. :0). Thank you for the smile. The front ones are. Grinding killed the back ones. 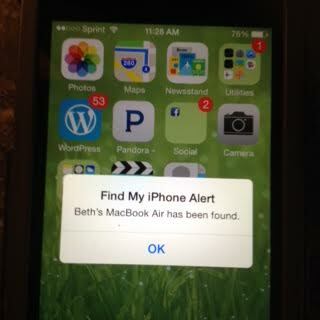 Same here, but I get my hubby to track my phone as I tend to lose all devices at the same time. I’m pretty sure I’d lose my head if it weren’t screwed on. Happy Monday ( a bit late) … “an acceptance of this past time as my way of life happy that at least i know where my teeth are.” A really good, enjoyable, post … written by the same blogger who, at some point, did not have her glasses on. This post resonates with many sojourners including me. Several recent experiences have held both loss and frustration / chaos / stress. Temporary misplacement of my c.c. while in Chicago O’hare trying to get back home from Michigan vacation followed by a “voided” flight there in O’hare … followed by being stuck in O’hare for about 7 hours before United came to their senses and gave me a flight … 24 hours later, my trauma is fading, and your post is a bonus. At times, life seems like a cold, crowded, airport, where your flight has been cancelled and you are in “a holding pattern”. Have a good week Beth. I found myself nodding the whole way through haha.